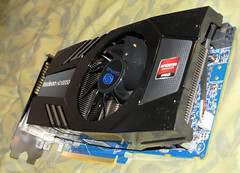 SPCR • View topic - Sapphire Radeon HD 6850 very silent and not even vapor-x ? Sapphire Radeon HD 6850 very silent and not even vapor-x ? 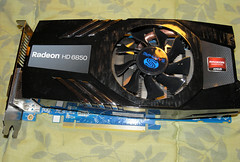 Post subject: Sapphire Radeon HD 6850 very silent and not even vapor-x ? Sorry for this strange request, but thanks for your consideration. It looks like the quiet idle has been achieved by a somewhat higher idle temperature. Ah, I forgot about googlish. Thanks! I don't know what you mean by "fishy". They don't mention anywhere that "nVidia must die" nor do they thank AMD for their new cars. But the noise recordings are indeed curiously low. Indeed...they claim that the 6850 comes in at 10.8dBa...for one, decimal places are pretty pointless. You probably wouldn't be able to hear the difference of a single dB, let alone 0.1 of a dB (depending on conditions, of course); that, plus margin of error and sample variance. Secondly, and more importantly, I have my doubts that they have access to equipment that can measure that low, nor access to an anechoic chamber with such a low noise floor. Heck, even SPCR's anechoic chamber only goes down to 13dBa, off the top of my head. Someone please correct me if I'm wrong about that though. My guess: they deducted the noise floor from the readings (so it's really 11+23=34 dBA). Last edited by Das_Saunamies on Sat Oct 23, 2010 11:16 pm, edited 1 time in total. Well, what they say is basically that new cards are better performance-wise and quieter, BUT with higher temps and TDP's.I cannot make out though, how exactly a card can be quieter, having higher TDP (and temps not going through the roof). I cannot make out though, how exactly a card can be quieter, having higher TDP (and temps not going through the roof). AMD sacrificed some cooling to make the fans slower, figuring the GPU can handle it. 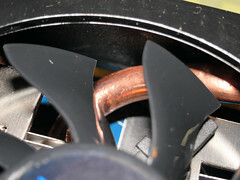 Sapphire added a more efficient heatsink, lowering the fan speeds further. Nothing unusual about it. Heck, even SPCR's anechoic chamber only goes down to 13dBa, off the top of my head. Someone please correct me if I'm wrong about that though. Link to SPCR test chamber is on the front page, easy to check. OTOH, I follow HT4U reviews for a long time and they seem to be pretty consistent. If general perception is that card A is quieter than card B, card A gets lower dBA measurement from them. Just check Hawk, Cyclone, Vapor-X and other known brands in older reviews. They probably have their equipment and methodology described somewhere on their web site. I can't read German. But I can't see why they can't be trusted either. Since Silent PC Reviews very rarely covers video cards HT4U.net and techpowerup.com are the only sites to get the information about noise. Correct me here if I'm wrong. I ordered Sapphire 6850. I hope I will be able to report in one week based on my uncalibrated ears. The Asus 6850 card has non-standard cooling and is less noisy compared to the standard cooling (on HIS cards). 28dB(A)/38dB(A) is by no means silent, but perhaps tolerable to some for that kind of a card. I'm personally waiting to see other after market and 3rd party coolers before I plunk down my hard earned euros. +1: they are among the very few which give consistent information about. However, that Sapphire (but is its cooler similar to ASUS Direct-CU?) doesn't seem to me particularly quiet at load. I got the card. I only tested it at idle. It is not silent but it is very quiet. When I move my ear ~3-4 inches close to the card I can hear crackling fan noise. Can't hear it from 1 meter from open case. BTW, the noise can be reduced if I slow down fan with my finger. My setup is pretty quiet, I got Seasonic X-650 PSU that doesn't spin fan at low loads, CPU fans at 300 RPM and I disconnected case fans. I have Samsung F2 HD502HI HDD that is rated at 12 dBA at idle by SPCR. 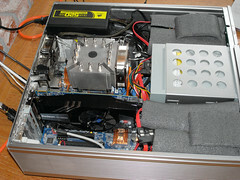 It is suspended in HDD Silencer enclosure. I tried disconnecting it and compared with stopping Sapphire fan. The HDD is louder than this card at idle. That's for sure. The Sapphire and HDD are the only things that can be heard when Antec P182 case panel is removed. Nothing is heard when the case is closed. So, I think I can conclude that HT4U rating is correct. It is that quiet as they report at idle. Sorry, I can't perform load testing now. Don't have time. The reason I didn't do it right away is that this card will go to another PC, HTPC, that is not currently as quiet as my desktop (PSU in particular). I won't be able to estimate idle noise there so that I did now. I didn't even install drivers. I will install it in place on weekend and will report again. But for now, I think, you can refer to HT4U measurements and expect it to be as noisy at load as they indicate. So, I would not hope for silence at load. I think Sapphire has some fan control utility which I'm also going to test. Thank you very much micksh, i'm glad it is quiet. According to Catalyst CC, what's the rpm percentage of the fan at idle? I don't have Catalyst, I have NVidia cards everywhere. Didn't want to mess up desktop so didn't install drivers. Will do it by the end of this week on another PC. Here is default fan behavior. All numbers taken after ~15 minutes of activity when fan had stabilized. Percent of fan speed followed by GPU temperature according to Catalyst. 52% / 68C - Playing Crysis, case closed. 68% / 75C - Furmark, case closed. Can't hear difference between 20% and 24-26%. Not sure if fan really goes below 26% although Catalyst displays 20%. For blu-ray playback the difference in temperature between fan locked at 20% and default 36% speed is small. So is audible noise. It looks like 36% is not that much louder than 20-26%. The difference between 52% and 36% is apparent. Fan locking seems to work - with fan locked at 20% temperature raised above 80C quick enough when Furmark is running. Note that my case doesn't have much airflow for GPU, only vents at the top. In previous post I tested idle noise in bedroom at night and my house is in quiet area. Now the testing was done in living room during the day - there was some ambient noise of course, nothing loud though. In this PC I have Corsair HX520W PSU which makes 22 dBA at 0~300W according to SPCR. This is the loudest component in my HTPC. That is until Sapphire fan stays at or below 36%. Noise becomes comparable somewhere between 40 and 45% of Sapphire fan. At 24-26% fan still can be heard if I move ear ~4-5 inches close to the card. Some quiet crackling noise. At 36% I can hear moving air and a bit of humming. Crackling fades in other noises. At 52% noise becomes louder than power supply. It can be heard from 8-10 feet but it is not that disturbing. Sounds like a decent fan at high speed, nothing exceptional. 64-68% is a bit louder, may sound like a typical PC. Still decent to me. It is Furmark after all. Don't have noise measurement tools and can't describe better. I could not find any fan controlling utility from Sapphire. Honestly, default fan behavior is good enough for me. If someone gives me a link to some utility I could test it. I bought this for HTPC because of HD audio and 3D blu-ray and also for some occasional gaming. It is quieter than MSI 8800GT that it replaced and Asus GT240 GDDR5 (this one at low load only) in another PC. Alternative is probably MSI 460GTX Cyclone which seems to be louder than this Sapphire according to HT4U. Should be so because 460GTX requires more power, two PCIe connectors instead of one. My typical use - watching HD video 8-10 feet from HTPC is very comfortable. But note that Corsair HX520W does not bother me much, though I can hear it. It's just quiet enough. Now since louder MSI 8800GT is gone I may consider replacing PSU though. MSI 8800GT was not bad either. Was at similar noise level as HX520W during video playback. So, my resume is - very good card for gaming HTPC. OK, this card can actually be loud. I left it overnight for Furmark stability testing and it had fan spinning at 72% in the morning (GPU temperature = 75C). This is kind of loud in the morning. Then I let my son to play Stalker for one hour (in headphones) and the fan was at 50% which to me seems reasonably quiet for gaming. If I will want to make this PC quieter for blu-ray playback I may have to do something with fan control during the summer. With ambient temperature ~26C I expect fan to be at 40% or a bit more during blu-ray playback. If I replace power supply with quieter model this will probably be noticeable. It should be no problem to keep fan under 30% though, then it will be quiet. Thanks for the information. Looking to get one of these. Anyone know if the other models have a better cooler than the Sapphire? Hard to tell from the pics if Asus, MSI, HIS, or Gigabyte has the best cooling system. 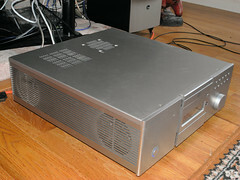 Edit: What about the Powercolor 6850 with a Zerotherm heatsink? imac 7,1 C2D 2.0, 3 GB 250GB. Thanks for the data micksh! As an aside, before you replace your PSU, consider doing a fan swap. $15 and a bit of time vs. the cost of a new supply. A related post. Now i'll go slightly offtopic, not too much i hope. I'm split between getting a Sapphire 6850 or a Gigabyte GTX460 (the windfart... ehm... windforce 2x fan cooler), if any of you have an idea about their noise it could be of great help. Performance-wise they're close (6850 a bit behind while costing a bit more, but since it's so new it might improve and get on par with new drivers), i know the 460 should be slightly more power hungry but the cooling seems better enough to consider it. I can't decide, this Sapphire seems good too. Vapor-X (or similar cooling systems from other manufacturers) should be better but i have no idea how long it will take for them to make one and i'm quite in a hurry to get a new GPU. Anyway, the wapor-x cooler is small. The 6850 one is not vapor-x, but it is bigger, so i think it's not an issue. Try msi afterburner, it normaly Works great for custom fan profiles sub 20%. Latest revision is from 2 of september, so hopefully its ok.
MSI Afterburner works well. I had it installed for NVidia card and it refused to work when I replaced card to AMD. Then I downloaded and reinstalled it and it worked fine. Created fan profile that should allow watching HD video with fan at 20% in summer. Will be replacing fan in PSU soon. Thanks for the tips! Had to install latest AMD driver hotfix, 10.10d. I started with plain 10.10 then Total Media Theater caused BSOD sometimes. 10.10d fixed it.